In regelmäßigen Abständen zitieren Medien ein von Klimaaktivisten lanciertes Paper, dass angeblich einen 97-prozentigen Konsens zur Theorie des gefährlichen anthropogenen Klimawandels fand. Bei näherer Betrachtung zeigt sich jedoch, dass auch moderate klimaskeptische Ansichten in die 97%-Kategorie fallen. Ironischerweise hatten die Autoren den Wert 97% bereits vor Beginn der Untersuchung als Zielgröße ausgeplaudert. Die Daten wollten die Autoren zunächst auch nicht rausrücken. Rationalen Beobachtern wird schnell klar, dass das Paper wenig Wert hat. Requests for the data were met with evasion and foot-dragging, a clear breach of the publisher’s policy on validation and reproduction, yet defended by an editorial board member of the journal as “exemplary scientific conduct”. Cook hoped to hold back some data, but his internet security is on par with his statistical skills, and the alleged hacker was not intimidated by the University of Queensland’s legal threats. Cook’s employer argued that releasing rater identities would violate a confidentiality agreement. That agreement does not exist. 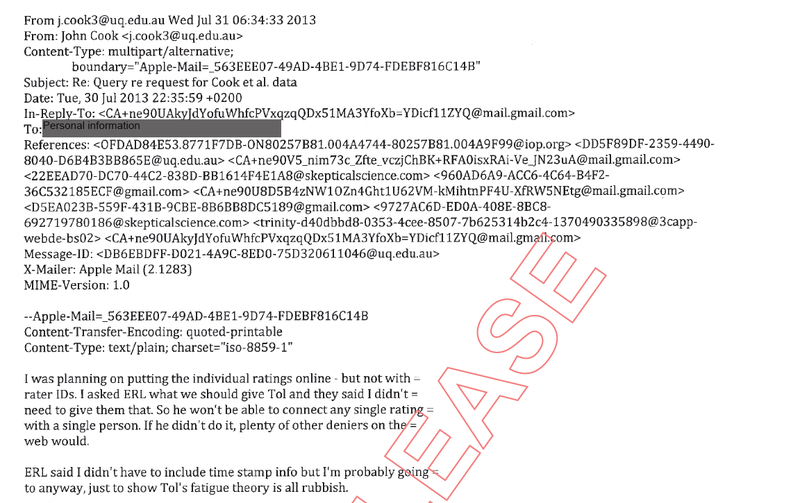 Cook first argued that releasing time stamps would serve no scientific purpose. This is odd. Cook’s raters essentially filled out a giant questionnaire. Survey researchers routinely collect time stamps, and so did Cook. Interviewees sometimes tire and rush through the last questions. Time stamps reveal that. Cook later argued that time stamps were never collected. They were. They show that one of Cook’s raters inspected 675 abstracts within 72 hours, a superhuman effort. The time stamps also reveal something far more serious. After collecting data for 8 weeks, there were 4 weeks of data analysis, followed by 3 more weeks of data collection. The same people collected and analysed the data. After more analysis, the paper classification scheme was changed and yet more data collected. Cook thus broke a key rule of scientific data collection: Observations should never follow from the conclusions. Medical tests are double-blind for good reason. You cannot change how to collect data, and how much, after having seen the results. Climate research lost its aura of impartiality with the unauthorised release of the email archives of the Climate Research Unit of the University of East Anglia. Its reputation of competence was shredded by the climate community’s celebration of the flawed works of Michael Mann. Innocence went with the allegations of sexual harassment by Rajendra Pachauri and Peter Gleick’s fake memo. Cook’s 97% nonsensus paper shows that the climate community still has a long way to go in weeding out bad research and bad behaviour. If you want to believe that climate researchers are incompetent, biased and secretive, Cook’s paper is an excellent case in point. Lesen Sie Tols vollständigen Artikel in seinem Blog. Es lohnt sich. John Cook arbeitet gelegentlich auch gerne mit Stephan Lewandowsky zusammen. Eines ihrer gemeinsamen klimaaktivistischen Papers wurde von der Fachzeitchrift “Fronters in Psychology” im April 2014 wieder einkassiert. Die Publikation wurde wegen Fachbeschwerden annulliert. Lewandoswky war auch an weiteren Veröffentlichungen im Jahr 2013 beteiligt, in denen Klimaskeptiker in die Nähe von Verschwörungstheortikern gerückt wurden. Die Datenbasis dieser Lewandowksy-Studien wurde nun von Ruth Dixon und Jonathan Jones nachanalysiert. Dabei kamen die beiden Forscher zu einem erschreckenden Ergebnis: Die in den Papers präsentierten Daten lassen die gezogenen Schlussfolgerungen gar nicht zu. Die Publikationen sind demnach nicht mehr haltbar. Reanalysis of the survey data sets of Lewandowsky, Oberauer, and Gignac (2013) and Lewandowsky, Gignac, and Oberauer (2013) indicates that the conclusions of those articles—that conspiracist ideation predicts skepticism regarding the reality of anthropogenic climate change—are not supported by the data. Nonlinear relationships were overlooked in both analyses, and this resulted in model misspecification. The authors used structural equation modeling (SEM) assuming linear relationships between the variables, and it is essential to test this assumption (Bentler & Chou, 1987, p. 86; Ullman, 2007, p. 683). In this Commentary, we show, using nonparametric local regression, that this assumption does not hold for the relationship between conspiracist ideation and views on climate science, the relationship that produced one of the central claims of both articles and the majority of the press interest (e.g., Corner, 2012; Pearlman, 2012). Siehe auch Diskussion auf WUWT.